register, read directions at resource center and start learning more! Free Wilderness Medicine mini lessons With any purchase! PLUS 2 days of mostly skills IN-PERSON: Take 8 lessons online at your time and pace. Then, 2 days in-person to complete the training. BONUS paid registration 30 days in advanceearly. First day of class you may select a bonus gift. PLUS 1 day many skills IN-PERSON: Take most of the course online at your pace. Then, 1 day in-person to complete the training. BONUS: If you sign up online in advance, receive a free bonus the day of class. Dates: Various - see below. WFA 16Hr 4 online lesson plus 1 day: Oct 20, 2018 S. of Golden, CO.WFA 16Hr 4 online lesson plus 1 day: Nov 3, 2018 S. of Golden, CO. This is a continuation of our WFA20 Wilderness First Aid course. This four lesson, four quiz, 16 hour segment to be taken in addition to WFA20. Group and individual in-person session available in customized formats usually of 2 Skill days, arrange through WMO office. Cost varies with location and number of students--example $375 @ for 7 student size class in Denver area. The add to cart amount is only for online portion. 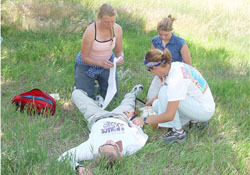 This blended learning course meets most basic outdoor Wilderness First Aid (WFA) requirements. It includes both online self pacing studies and in person review and hands on skills with an instructor. We are asked daily if we can help with a skill instructor in [blank] town and YES WE CAN but we need your help to get you trained in time with the skill instruction listed under details. Click the Details link below. Student receives access to four online video lessons. and includes an 76 page text to download.